Multi-billion dollar lending to Ukraine by the International Monetary Fund (IMF) and World Bank has stopped amid growing doubts among country board directors at the two international organizations that the Ukrainian Government can meet repayment commitments and loan covenants for 2015, or deliver on reform promises and budget financing targets tabled in Kiev this week. For the first time since the change of government in Ukraine last February led to civil war in the east of the country, European bankers and multilateral fund sources acknowledge that Kiev is now likely to default on its international debts, and will seek a reorganization of its bond debt. This will hit Franklin Templeton, the US investment fund which has accumulated up to $9 billion in Ukrainian bonds on a wager to make a $4 billion profit – if the US Government guarantees full and timely repayment. 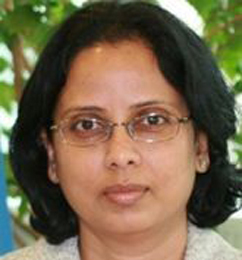 IMF officials refuse to elaborate on the new terminology which the Fund began issuing last week to describe the suspension of cash disbursements under the Fund’s existing $17.1 billion programme, started last May. For the fine print of the IMF programme, read this and more. David Lipton (below, left), the former US Treasury and White House official who is now deputy chief executive of the Fund, announced in Kiev on Friday: “A Fund team conducting technical discussions is expected to conclude its work by the end of the coming week. A mission to conduct policy discussions in the context of the Fund-supported program is expected to return to Kyiv early next year.” He said this after meetings with President Petro Poroshenko, Prime Minister Arseny Yatseniuk, Minister of Finance Natalie Jaresko, and Minister of Economy Aivaras Abromavicius. Jaresko (below, right) is an American national; Abromavicius, Lithuanian. Gueorguiev (right), a finance ministry official in Bulgaria before he joined the Fund, was in Kiev on a two-week data -collection and “technical” negotiating mission in November. He returned on December 9, and is scheduled to remain there until December 22. He has confirmed that the IMF technical discussions cover staff analyses of whether the Ukrainian government can meet state financing and debt obligations, as they fall due. Gueorgiev’s record in negotiating compliance with IMF conditions, along with special favour for Igor Kolomoisky’s Privat Bank, can be read here. A Polish financial source monitoring these negotiations comments: “So now Gueorguiev & Co. are collecting data. And they had been doing this already during their mission in November. This is a lot of data collecting, especially in modern times where everything can be shared electronically without leaving DC. It looks like the IMF is cornered with their program in Ukraine and they are buying time.” Poroshenko will make a state visit to Warsaw later this week to ask for Polish financing for the Ukrainian military. Gueorgiev and Murray were asked overnight to clarify that the “policy discussions” planned for January are to consider the request from Kiev for a new programme of unconditional grants without compliance with the IMF programme. A request for $15 billion in grant money was announced by Yatseniuk, after Gueorgiev’s arrival and before Lipton’s landing — “ in order to prevent a default, we need an international donor conference”. Gueorgiev and Murray refuse to say what this means for the IMF conditions, on which the Fund directors have been insisting before a new tranche of the agreed loan can be released to Kiev. Source: IMF, FIRST REVIEW UNDER THE STAND-BY ARRANGEMENT, REQUESTS FOR WAIVERS OF NONOBSERVANCE AND APPLICABILITY OF PERFORMANCE CRITERIA, AND A REQUEST FOR REPHASING OF THE ARRANGEMENT (August 18, 2014) – page 47. To date, converting Special Drawing Rights (SDRs) in the table into US dollars, $4.3 billion in IMF transfers scheduled between July 25 and December 15 have now been put off. Another $2.1 billion had been scheduled by the IMF for release by next March 15 on condition that the IMF staff and board agreed by the end of this month that Kiev was meeting the “performance criteria.” Altogether, a third of the IMF’s financing agreement with Ukraine has now stopped because the Ukrainian Government is failing the “performance criteria”. In IMF lingo, performance criteria, loan covenants, programme conditionality, and financing assurances are all synonyms for what staff and directors believe to be in violation right now. At the World Bank, officials are clear that negotiations for a new $500 million loan to support failing Ukrainian banks through the Deposit Guarantee Fund (DGF) have been postponed until next February at the earliest. 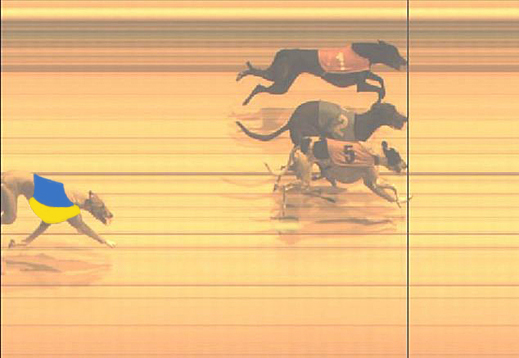 The officials are less certain about how much money has actually been turned over to date. For details of what the World Bank is calling its “First Programmatic Financial Sector Development Policy Loan” (FSDPL1), read this. Days after that was published, the World Bank official in charge, Alexander Pankov, returned to Washington; Pankov is Russian. He was replaced by Lalita Moorty (right), an Indian. World Bank documents fail to show that a terms and conditions document for FSDPL1 was signed, following authorization of the loan by the World Bank board. Bank sources confirm, however, the money was paid out “in early September”. In charge of Ukrainian bank bailouts in Washington is an Indian, Jinku Chandra; he was earlier in charge of World Bank bailouts for Balkan and Baltic banks. In September Chandra was promising the Ukrainians to accelerate the bailout cash. A month later, a World Bank report on the status of exposure to Ukraine claimed there would be a Board review of the first loan performance, and compliance at the Ukrainian banks, in December. As for the second $500 million, that is now “expected in the third quarter of FY15”. 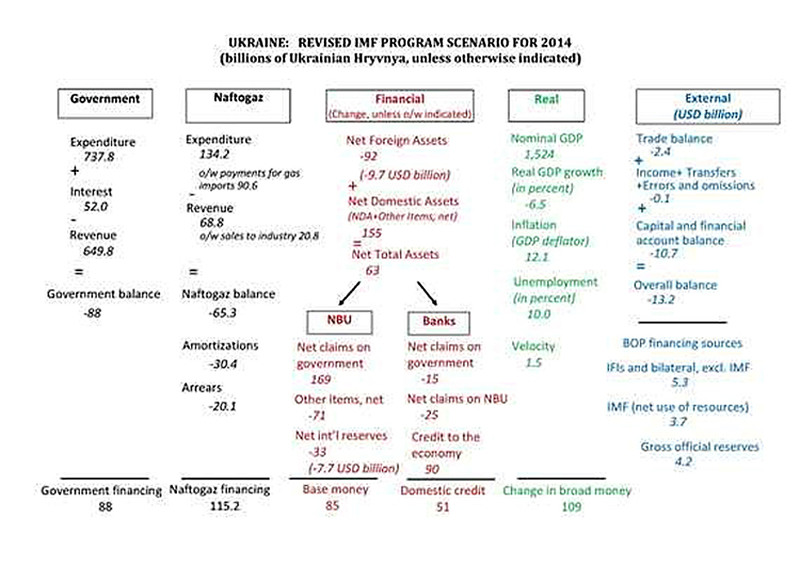 Kirilenko’s technical discussion was based on the IMF’s August numbers for the Ukraine. Gueorgiev won’t say so, but his data collection in November and last week reveal the financing shortfall for 2015 is much worse. Yatseniuk has announced the shortfall estimate is now $15 billion. 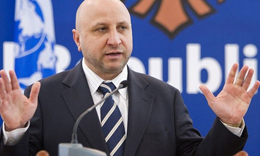 Jaresko, one of the Vikings Kirilenko recommended to take over, was reported last week as proposing expenditure cuts below the August IMF target of 33% — from UAH 737 billion to 496 billion. The leaked cuts from Jaresko’s ministry reportedly include reducing the number of parliamentary deputies from 450 to 150, cutting obligatory schooling from 11 to 9 years, abolition of constitutional guarantees of free education and medicine, raising the pension age, and cancelation of pension indexation for inflation. Herself under investigation for running a $150 million programme of US cash for Ukrainian political targets, Jaresko’s Kiev company, Horizon Capital, has taken down the corporate website disclosing details of where the money has been placed. The website is now inaccessible. According to a source inside Horizon’s Kiev office, the website will be back online by “Thursday or Friday”, or perhaps not until “the week thereafter”. Another major American stakeholder in Ukraine’s default status is currently denying reports it authorized a few days ago that it is risking almost $9 billion in value on a US Government guarantee to prevent Ukraine from defaulting on its bonds. According to reporting by the California-based Franklin Templeton Investments group, it is currently holding about $8.8 billion in Ukrainian bonds. 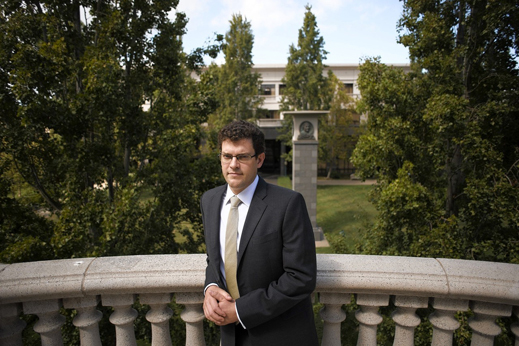 The number appears in advertisements placed by Michael Hasenstab (below, at company headquarters), the chief government debt trader for the group, in The Economist and Wall Street Journal. The Journal reported, and Hasentab confirmed, that as of September 30 the Ukrainian bond value held by his group was $8.78 billion. But missing from his media placements is the price Franklin Templeton paid for its Ukraine bonds. Market sources believe the outlay was less than $4 billion. If it can collect face value at the scheduled maturity, the profit would be roughly 100%. But if there is a bond default, followed by a long-term extension of the maturity date and a cut in redemption value, Franklin Templeton stands to lose most of its outlay. 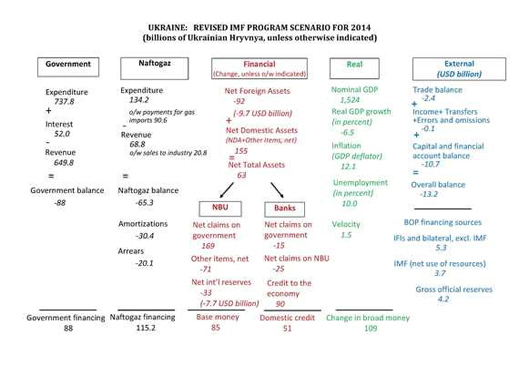 According to Hasenstab, he’s indifferent to the IMF support for the Ukraine. “Their presence or lack of presence does not solely direct our investments.” He told The Economist that even if the Ukrainian bailout fails, the impact will be small on Franklin Templeton’s portfolio because Ukrainian paper makes up “only 4.5% of their holdings”. The percentage of Ukrainian paper held on March 31, according to a group publication, was half as much – 2.3%. Since then, Hasenstab appears to have been selling Russian bonds to buy Ukrainian. Franklin Templeton executives, including Mark Mobius, executive chairman of the emerging markets division of the larger group, were asked to confirm the published data on their Ukraine bond holdings and Hasenstab’s remarks. 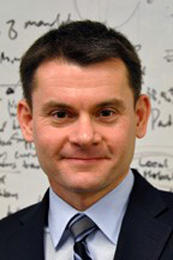 Spokesman for Franklin Templeton’s Eastern Europe division, Adnan Abdel-Razzak, now claims the publications weren’t authorized; Hasenstab didn’t mean to talk about Ukraine; and “as a matter of policy, we do not disclose aggregate holdings of country exposure.” He provided links to dozens of fund reports but refuses to confirm the aggregate value of the Ukraine debt the group has bought. European bankers differ on what this means for the effort US Government officials are now making to get German and other European Union donors to stump up the $15 billion in extra cash to prevent a default. One source says the US Government will have to commit most of the money first. If it doesn’t, the Europeans will delay their commitments. The longer this delay, the more protracted the IMF “policy discussions”, the more certain the default. With an outlay of at least $4 billion and a profit of more riding on the outcome of the Ukrainian bailout, Mobius and Abdel-Razzak were asked to comment on the Ukraine government’s request for an external grant programme from the “donor community” to prevent a bond default. They were also asked if Franklin Templeton has discussed the default options with US Government officials, with Finance Minister Jaresko and with other Ukraine Government officials. They refuse to say.